It took place at the Radialsystem in Berlin, the coolest performance space in Berlin, a former water utility plant, attracting a rather special, very young audience. I played the suites from four different locations within this hall which can seat up to 600 people, but because we wanted the atmosphere to be rather relaxed and unconventional, we pulled the chairs a bit apart, added some lounge furniture and mats for people to even sit on the stage on the floor, which finally gave room to almost 500 people. I started the first suite in the back of the hall in total darkness – the light went slowly on within the Prelude. Before moving with the applause to my second location off-center stage left, I took a microphone to welcome the audience and explain what we were trying to achieve with this different setting, encouraging people to take breaks in between – no obligation to listen to every single of the suites, or rather listen outside on the terrace or in the bar while drinking a glass of wine. The third location for Suites No.3 and 6 was in the back of the stage center, surrounded by the people sitting on the mats, and the 5th Suite I played high up from the gallery, the hall almost dark, just some blue light on me. This changing of lights, locations and talk in between may have created a more personal atmosphere between me and audience, but I think it took even more energy from my part than the stereotype way of doing a concert. I felt the audience with me much stronger than usually which was very inspiring, but at the same time very demanding – I felt obliged to live up to their expectation in a different way, almost like a story-teller in an Arab market where the audience is longing for his unbelievable stories, and when he looses his thread or can’t come up with something really exciting, the people will walk away, so he has the pressure on him to provide some constant spark. During the 6th Suite I thought my fingers were going to fall off, my left arm felt so stiff and tired that I considered more than once to just give up, stop and leave. The title of the concert, Bach-Marathon, wasn’t suggested by me, but in that moment I realized that it was justified. I have never ran a marathon, but I could very much imagine that one has similar feeling during these 42 kmâ€¦ Afterwards the artistic boss of the hall and me had a talk in front of still maybe a hundred members of the audience who also got to ask some questions – it was about midnight when we wrapped up the whole concert with a steak and a glass of wine in the bar of the hall. While I have been fulfilled with some of my performances playing Shostakovich, Dvorak or Prokofiev, I admitted last night in front of everybody, that with my Bach performances I have never ever been satisfied. No, I don’t think I play Bach badly, but there are so many possibilities how to play it, so many hidden difficulties which only seem to come out while playing it in public, and worst of all, there is the style issue which one can’t forget about either. Vibrato, yes, but not too much. Articulation important, but not at the expense of colours and sound. A constant compromise in a way, but it mustn’t sound nor feel like one – for me the most challenging of all concerts, by very, very far. I was in the audience last night and it was one of the most impressive concerts I have ever been attending. It was perfection – with a human touch. I experienced not only a great musician but a sympathic and humorous person. 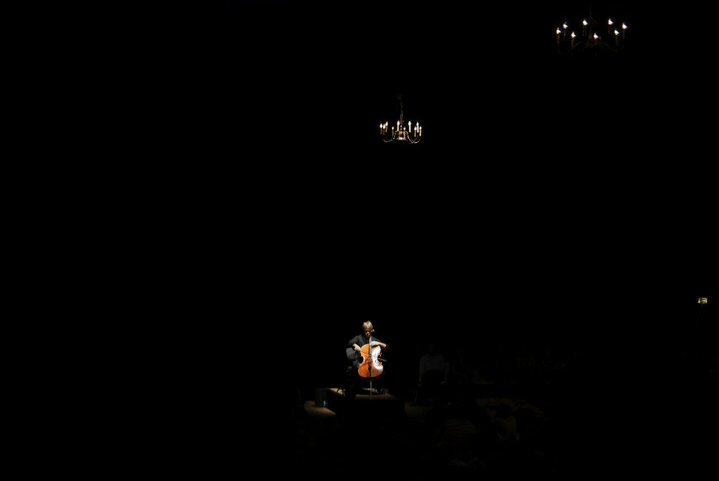 Thank you, Alban Gerhardt, you created a great event with just you and your cello. Ã¶fters habe ich es als physisch anstrengend und kÃ¼nstlich empfunden, inmitten von einem fremden Publikumsblock zu sitzen und zuzuhÃ¶ren, bloÃŸ nicht husten, bitte unter Kontrolle bleiben usw. – selbst wenn die Musik mir gefiel. Wie wird so etwas aufgelÃ¶st?! Gestern ist es jedenfalls gelungen… und das Konzert war wunderbar *** Gefreut habe ich mich auch Ã¼ber die Bemerkung “ich habe nichts dagegen, mich zu irren”, so etwas hilft in stressigen Zeiten. Vielen Dank! So impressed, I have run a marathon but I doubt I could match that intensity and especially skill 🙂 well done! Bravo to you Alban…Yes, it’s me…(i’m still around)..what a marvelous acheivement..I would love to see pictures of the performances and you with the lighting you describe at the various locations in the hall…I find it hard to believe that this was more difficult than the Suk concert…but I’ll take your word for it…I have not checked your blog for quite some time…You are still out there amazing people with your artistry..Your not gettting old…your getting better!…All the best to you!! Oh Alban, your description of your feelings about that amazing conert is so vivid I almost felt I was doing it with you (and I haven’t a clue how to play the cello). Jennifer told me she is going to hear you play the Bach suites at the Stresa Festival….I would so love to be there too. However the ‘marathon’ is going to be divided up I see. Well done, would love to hear them at the Wigmire (sic – liven it up a bit). You’re in good company – the mighty Natalia Gutman has been playing them (not sure if all six) at Verbier at around the same time. Just missed her there, curses. wow, what an experience this must have been, for both the player and the audience!